Here is another Craft Project Central Project for May. 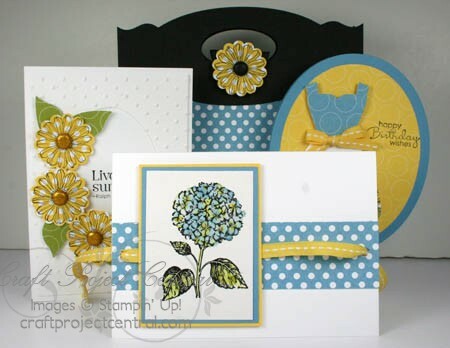 It's a gorgeous card set, and it's designed by Sharon Burkert. You can see her other creations on her blog, As the Ink Dries. If you would like to learn how to make this project, you'll want to subscribe for the month of May. With your subscription, you'll get illustrated, step-by-step instructions for 10 wonderful projects for only $10! You can find out how to gain access to a bonus eleventh project over at Craft Project Central. Please leave a comment for Sharon to let her know how great her project is, too!